We’ve determined where we’re currently investing our resources and what’s happening relative to the context of our business in the four areas of market, customers, competitors and company. Now it’s time to identify the differentiated value we provide to customers and allocate resources accordingly. A great deal of resource allocation goes like this: “Here’s what we did last year. Here’s our budget for this year. Guess we can do the same tactics minus a few this year and save some money to meet our reduced budget.” Now that’s the secret formula for continual mediocrity. 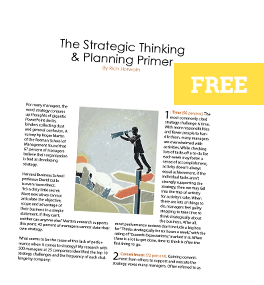 Instead of serving up this rehash of resources, try plotting out your strategy visually–yes, with a picture. The Strategy Profile is a great way to determine how you’re allocating resources relative to the competition on the key factors of industry competition. Here’s an example looking at the DVD rental industry. We can see that Netflix has clearly differentiated the way they allocate resources relative to Blockbuster and Hollywood Video. Even if we’re not experts in this industry, it’s evident that Netflix has a differentiated strategy which has enabled them to provide distinct value to their customers. What’s the differentiated value your products or services provide to customers? What other tools are you using to determine that differentiated value?